Among my observations of myself is this: I have have a capacity for both incredible persistence and quick surrender. I would not expect these things to co-exist in a person. Shouldn't they at least cancel each other out? But perhaps that's just simple math and doesn't apply to people. I started a book project years ago (more than I want to admit at this moment). I thought it was a great idea. An author/poet friend who I respect tremendously told me she could see it on the best seller list. I agreed. I was encouraged and did quite a bit of work on it. At one point someone gave me the name of an agent. I sent it to him/her (truly can't remember the gender anymore) and they said it wasn't a book. It was a blog, or a feed, or some equally deflating evaluation of what I had been certain until then was a big hit. So off to the back burner it went, just like that, fading into the horizon, melting in the face of climate change, sidelined, benched, taking an extended time out. Pick your metaphor. It's safe to say that there were full years when I didn't even think about it. That's how long ago this was, how complete my abandonment of belief and book. So in that second moment when my music publisher told me again about the book division, I was ready: "I have a book related to music," I offered slyly, proud of my private conspiracy. "I've been collecting people's dreams of Bob Dylan for...a while [silent internal laughter], some illustrations too. 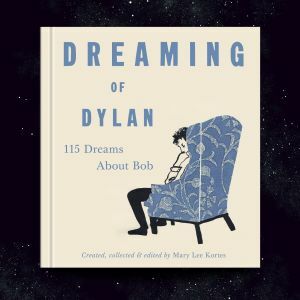 It's called 'Dreaming of Dylan: 115 dreams about Bob.'" "Hmm, interesting, send me a sample," my publisher said. Within a week they were on board, crazy about the idea, they definitely wanted to publish it. They would even give me a small advance. The catch was I had to finish the book first. Fine. Big deal. "That I can do," I said, an easy commitment after having reviewed my 15 YEAR OLD FILES and seen that I had already made quite an impressive start. And now here we are, publication date is less than two months away. It's enough to make me believe in magic. I couldn't be happier with the book. The dreams are beautiful, funny, moving, scary, disturbing, all the things dreams are. And the visuals are stunning. Wait till you see it! All of my hopes and dreams aside, this missive is meant to speak to you and remind you that if you have dreams you've put on the back burner, or even all the way out to pasture, maybe call them back for another look. Maybe give them a little food and water. You never know what's around the corner. Or what plays might be left in the game after your own time out.